I’ve been wanting to write this post for a while, but not really daring too. It flies in the face of so much of what I see on social media. Silk is almost universally adored for its lustre and softness. It takes a dye beautifully and for that reason is much beloved of hand dyers. And was much beloved of me too for a long time. But then I learned how silk was produced and I no longer see it as desirable. According to Chinese legend, Empress Hsi Ling Shi (there are multiple spellings of her name), was the first person to discover silk as wearable fibre. There are several variations of this legend, all on a theme. But they generally go like this; the Empress was drinking tea under a mulberry tree, and a cocoon fell into her cup and began to unravel. Or she saw a silk worm spinning it’s cocoon whilst out walking in the palace gardens and thought it would be wonderful to be attired in such a fibre. You get the idea. What is certain is that someone or a group of someones, three thousand ish years ago, discovered the fibre produced by the Bombyx mori silkworm found living on the white mulberry, and developed what is known as Sericulture, the cultivation of silkworms, and invented the reel and loom. Initially, silk was worn exclusively by Chinese royalty, but silk cloth spread gradually throughout the China and then into Asia and Europe. Demand for silk in Europe eventually created the trade route now known as the Silk Road, taking silk westward and bringing gold, silver and wool to the East. The Chinese wished to maintain their monopoly on this lucrative industry and travellers were searched thoroughly at border crossings with anyone caught trying to smuggle eggs, cocoons, silkworms or even mulberry seeds out of the country were summarily executed. However, eventually silk production did spread, first to Korea, then to India, Japan and Persia. And silk spinning and weaving became widespread throughout Europe. There is an old silk mill quite near to my home although it is currently closed (reopening August 2018). Silk is a remarkable fibre. In spite of its delicate appearance, silk is relatively hard wearing. Its smooth surface resists dirt and odours. It is wrinkle and tear resistant, and it dries quickly. It is also a surprisingly good insulator so is great added to wool for winter garments and it can be worn as a second layer underneath to warm without being bulky. It can absorb up to 30% of its weight in moisture without feeling damp so will absorb perspiration while letting your skin breathe, which makes it great for summer garments too. It’s also the most hypoallergenic of all the natural fabrics thanks to its unique structure. But the real oooh factor for silk is its unique sheen, which means colours radiate and assume a luminescence. So what is my issue? I’ll admit it. So far, this post has sounded like an advert for the silk industry. And this is as far as most people want to go when thinking about silk. But my discomfort comes from the way the silk is made. It’s time for a bit of biology. If you can remember back to your school days, and your lessons on the life cycle of the butterfly, the silk worm is very similar, in that, left to its own devices, the silkworm goes through 4 stages. The first stage is the egg. The female silkworm will lay up to 400 eggs in clusters on mulberry leaves. The female dies after egg laying. The eggs hatch into larvae in around 11 days. This larval stage is the second stage. The larvae eat the mulberry leaves and moult 4 times, growing bigger each time they moult. After the final moult, the larva spins a protective cocoon of silk around itself and turns into a pupa. This is the third stage. Nothing appears to happen at this stage but inside the pupa, the worm is undergoing massive changes called metamorphosis, which change the silkworm larvae into the moth. The moth breaks out of the cocoon and flies off to mate and, in the females’ case, lay more eggs and so repeat the cycle. So, silk production is terminal to silkworms. And this does not sit well with me. I’m not a vegan, or even vegetarian. But, I don’t eat meat everyday and when I do eat meat it is always high welfare and organic, if I can get it. I also use as much of the meat as I can, making stock for soup and risotto from bones and using up all leftovers. I acknowledge that animals have to die so I can eat meat. This does not make me feel warm and fuzzy inside (how could it?) but it’s something I think about, talk to my children about, and keep under constant review. But, I just cannot get comfortable with the idea that an animal had to die in order to give me a lovely lustrous garment, so I can look good. I just can’t look at silk garments and think they are gorgeous. I look at silk garments and see dead silkworms. Ah, but what about peace silk? Peace silk (sometimes called Ahimsa silk) is produced from cocoons that are collected after the moths have emerged naturally. This all sound soothingly natural and happily non fatal to the silkworm. However, there are no certification authorities for peace silk and it’s entirely possible for conventional silk producers to label their products as peace silk. Additionally there are no welfare standards for peace silk so the silkworms are still potentially subject to mistreatment, by, for example, being forced from their cocoons too early, or forcing the female moths to lay their eggs on trays rather than on mulberry leaves, and putting males into a refrigerator, bringing them out occasionally to mate and then throwing them away when they were no longer able to mate. In my experience, where there is money to be made and no authorities to check, abuses inevitably follow. My feelings also apply to recycled silk. This is basically the remnants of conventional silk left over from sari manufacture. It’s a nice way to make sure all the silk is used and not wasted but silkworms still died in order to produce it. So where does this leave me? Well, here is the thing, in relation to woollen garments, I don’t even need silk. In the last few years, silk has been increasingly blended with that most common of breed wools, Merino, because, despite its supreme softness, Merino doesn’t bear much lustre or strength, and silk gives it both of these. 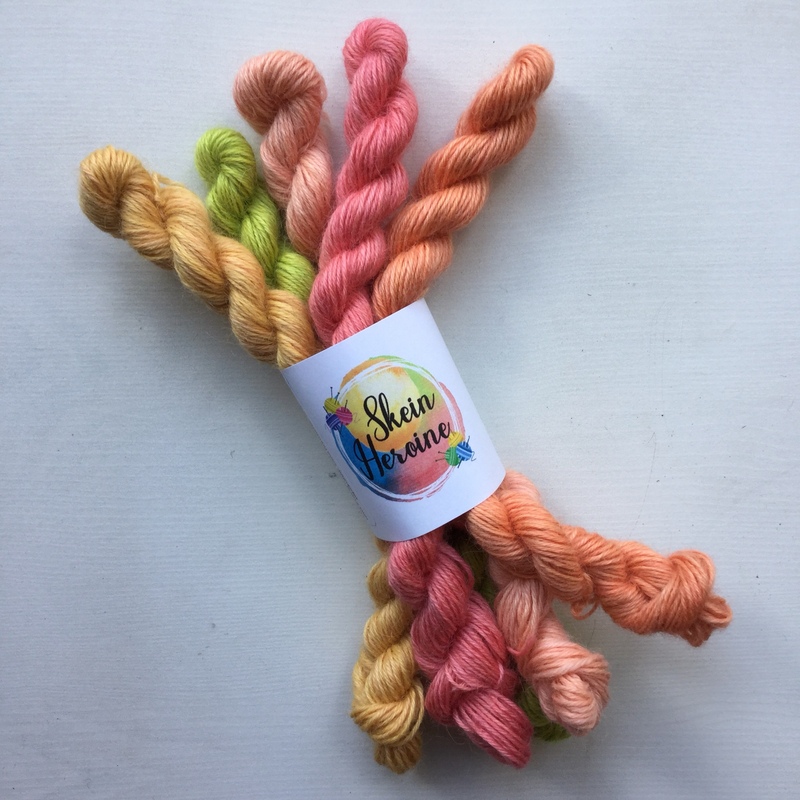 This is how I purchased most of my silk (before I felt out of love with Merino – but that’s a post for another day) and I do own a couple of hand knit sweaters in this blend. But, lately, I found myself wondering why I even need my hand knits to be shiny? What’s that all about? In any event, you only need to look to a breed like Wensleydale for softness and lustre. So, given I don’t need to wear silk, I’m happy to state that I’m not going to stock it in my shop. You will never see me dye pure silk or a silk blend. No more silkworms will die on my account!